The Taberna La Bola is a Spanish restaurant in Madrid which has been serving great Spanish food to locals and tourist in the capital for over a century. To ensure they serve the best, traditional cuisine of Madrid, this restaurant uses historic recipes and top quality ingredients. This historic tavern and restaurant has been around in Calle Bola (Boule Street), just a stone's throw away from the Royal Palace of Madrid, for over one hundred years. However the building itself is much older. Up until 1802, the building had been used as a liquor store and bar that mainly served locals and students in the local area. 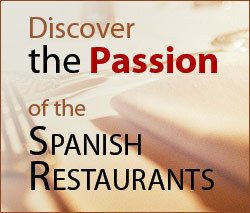 In 1870, the establishment was taken over by the Verdasco family who transformed it into a restaurant called 'La Rayúa'. According to the newspapers at the time, the restaurant served three types of meal which were preferred by three unique groups. Workers and employees would eat there at midday; students would eat at one o'clock, while the meal at two was the preferred dish of journalists and politicians. 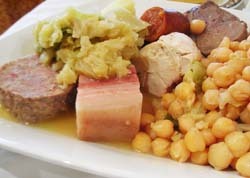 One of the most popular dishes amongst all the classes in Madrid was the 'cocido madrileño' which is a kind of stew that is typical of the region of Madrid. Since then, the Taberna La Bola has been handed down over the generations of the Verdasco family and is currently run by the sixth generation. The traditional cuisine has also grown and improved thanks to the century's worth of practise and experience. La Bola is un-missable with its corner location and bright red walls. Inside the restaurant is decorated in a typical 19th Century fashion with ample amounts of dark wood cladding, tiled floors and old wooden furniture. The walls are covered in antique paintings as well as a multitude of photos which depict moments from the restaurant and the Verdasco family's long history. One of the tings to look out for in the restaurant is the selection of antique lights which hang from the ceiling which provide the room with a warm atmosphere. The Taberna La Bola in Madrid is famous for its truly, authentic Spanish cuisine which has been improved to perfection thanks to the large amount of time the restaurant has been cooking the same dishes. If you really want to experience the best in Spanish food from Madrid then this restaurant is definitely worth a trip when you visit Madrid. The restaurant's most celebrated dish was and still is the 'cocido madrileño' which is a stew made of vegetables, chorizo, other meat and noodles amongst other ingredients. La Bola tries to keep their recipe as old-fashioned and authentic as possible by cooking the stew in the traditional way. This means that each individual portion of stew is cooked in its own earthenware stew pot over a low flame produced by an oak wood fire. The restaurant also makes use of the traditional earthenware crockery that is so common in Spain to serve some of their dishes and sauces. 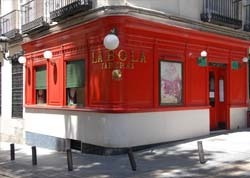 Other great dishes that can be found on the main menu at the Taberna La Bola in Madrid include 'chuletitas de cordeo lechal' (Suckling lamb chops), 'lomo de buey a la plancha' (Grilled beef steak), and 'Merluza de la casa' (House hake) which is hake served with egg, asparagus, peas and peppers. They also serve a great range of Spanish desserts including a typical 'flan al caramelo' (Caramel flan). Aside from the main menu, this Spanish restaurant also offers a selection of set menus for groups which are specifically designed for large groups and celebrations. You can also order a set menu of traditional Spanish tapas which is perfect for sharing between friends and family.